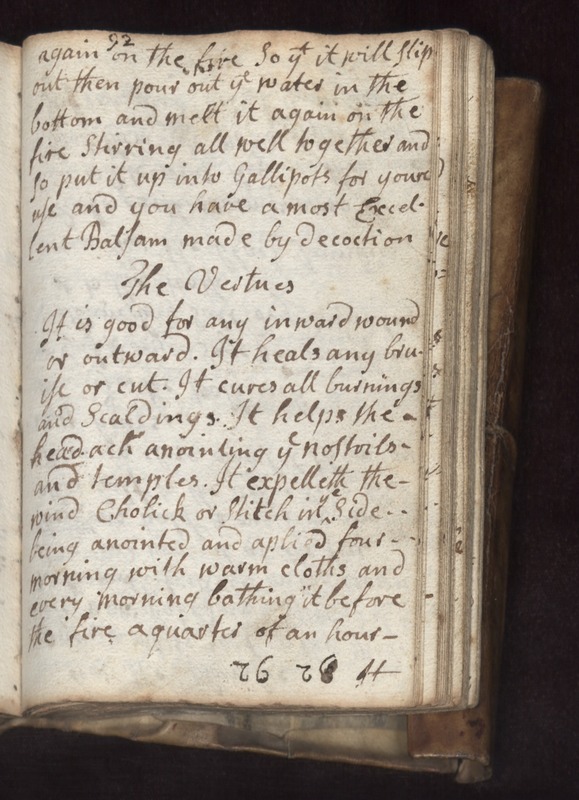 again on the fire So that it will slip out the pour out the water in the bottom and melt it again on the fire Stirring all well together and so put it up into Gallipots for your use and you have a most excellent Balsam made by decoction The Vertues It is good for any inward wound or outward. It heals any bruise or cut. It cures all burnings and scaldings. It helps the headach anointing the nostrils and temples. It expelleth the wind Cholick or Stitch in the side.... being anointed and applied four.. morning with warm cloths and every morning bathing it before the fire a quarter of an hour.